Have you ever dreamed of visiting a paradise island? Indonesia has some of the most beautiful beaches, waters teeming with marine life, and unique cultures. If you’re ready for a holiday in this incredible country, join our Instagram competition and you could win 2 nights free full board accommodation at the stunning Gangga Island Resort & Spa in North Sulawesi! Are you ready to discover paradise? Paradise exists and it’s called Gangga Island! Tell us in the comments below the Instagram post what your idea of paradise is and also tag the person who you would like to take with you to Gangga Island. The winner will be selected from the participants who have completed all the above requirements correctly. If you miss a step you won’t be in the running to win, so read the directions carefully! Enter between the 30th August – 30th of September. The winner will be announced on the 15th of October. The prize of a 3 day – 2 night stay at Gangga Island Resort & Spa can be enjoyed between the 1st November 2018 and the 30th of October 2019 and is subject to availability. This Lotus Hotels Instagram contest is a public contest organized by Lotus Hotels on Instagram. Instagram is not involved in any way in the organization of this contest. This Lotus Hotels Instagram contest purpose is to allow participants to comment and tag friends in a post to win a 3 day- 2 night stay at Gangga Island Resort & Spa for 2 people including full board. This Lotus Hotels Instagram contest is free of charge and open to anyone over 13 years old without any geographical discrimination. Lotus Hotels reserves the right to disqualify any participant to the contest if the nature of their comment is negative or offensive to others. This Lotus Hotels Instagram contest starts on 30th of August 2018 and finishes on the 30th of September 2018 at 23:59h (Bali time). 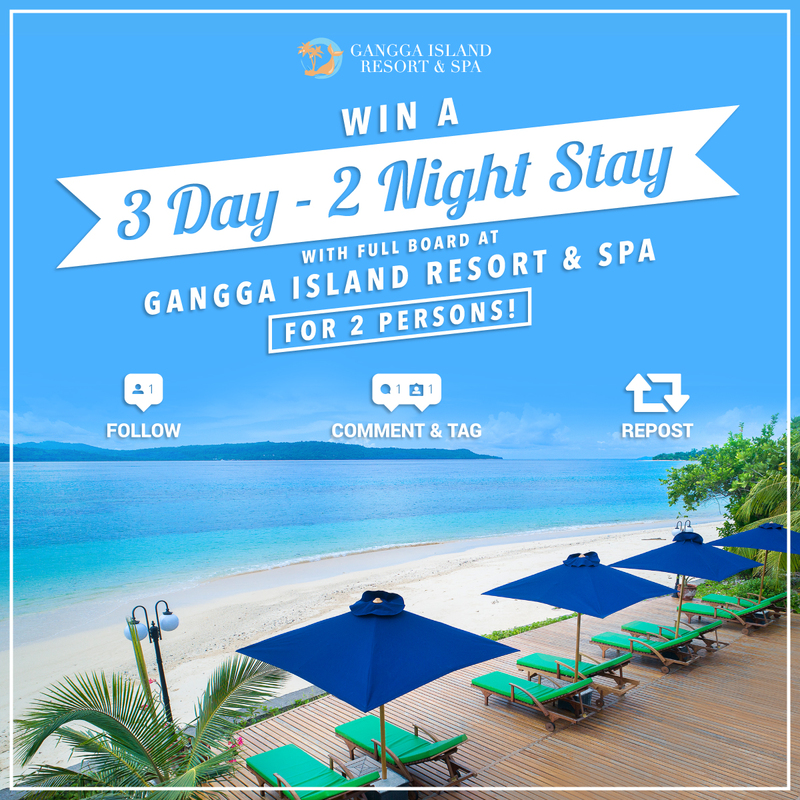 Contest reward: A 3 day – 2 night full board stay at Gangga Island Resort for 2 people. The stay must be used between the 1st of November 2018 and the 30th of October 2019 and is subject to availability. The promoter is PT. Lotusindo whose registered office is at Jl. Bypass Ngurah Rai No. 18 Jimbaran Bali 80364 Indonesia. Closing date for entry will be at 11:59 pm on the 30th September 2018. After this date no further entries to the competition will be permitted. The promoter reserves the right to cancel or amend the competition and these terms and conditions without notice in the event of a catastrophe, war, civil or military disturbance, act of God or any actual or anticipated breach of any applicable law or regulation or any other event outside of the promoter’s control. Entrants will be notified of any changes to the competition as possible by the promoter. The winner will be selected based on their answer as well as the engagement generated on the competition post when they share it on their Instagram profile. The winner will be notified by Instagram on the 15th of October 2018. If the winner cannot be contacted or does not claim the prize within 14 days of notification, we reserve the right to withdraw the prize from the winner and pick a replacement winner. This promotion/contest is not sponsored by, supported by, administered by, nor in any way associated with Instagram. The information collected is provided by Lotus Hotels and not by Instagram.